2019 marks the 400th anniversary of key historical events that occurred in Virginia in 1619 and continue to define America today. As part of the 2019 Commemoration, American Evolution, an array of special exhibitions, events, public lectures and programs will take place throughout the year at Jamestown Settlement and the American Revolution Museum at Yorktown. Through January 5, 2020: “TENACITY: Women in Jamestown and Early Virginia” Special Exhibition, Jamestown Settlement – Discover little-known, personal stories of real women in Jamestown and the early Virginia colony and their tenacious spirit and impact on a fledgling society. Through artifacts, images, interactives and primary sources – some on display in America for the first time – explore the struggles that Virginia Indian, English and African women faced in the New World, as well as their contributions. From women’s roles to women’s rights, the exhibit connects issues of the 17th century with their relevance today. A legacy project of the 2019 Commemoration, American Evolution. 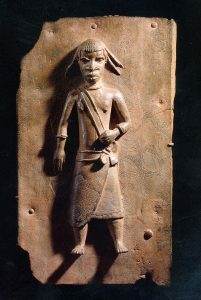 Benin copper alloy plaque, circa 1600. Jamestown-Yorktown Foundation collection. February 1 – March 2: African-American Cultural Heritage Month, Jamestown Settlement & American Revolution Museum at Yorktown – Through monthlong activities and demonstrations accompanied by engaging visuals and music at Jamestown Settlement, visitors can compare Angolan culture with that of the English and Powhatan Indians they encountered in Virginia. At the American Revolution Museum at Yorktown, periodic lectures throughout the month and daily programming explore the role and impact of African Americans on both sides of the war. February 23: After Angelo: Celebrating Black Women in America, Jamestown Settlement – Angelo is the first African woman mentioned by name in the historical record at Jamestown. Her legacy and African women in Virginia are honored with music, dramatic performance and historical presentations in celebration of African-American women from 1619 to today. An evening ticketed concert performance will accompany this event. March 7: Tenacious Women Lecture: “Queen Victoria: Daughter, Wife, Mother and Widow,” Jamestown Settlement, 7 p.m. – Dr. Lucy Worsley, OBE, Chief Curator at Historic Royal Palaces and one of British TV’s leading public historians and authors, presents an illustrated talk that makes you rethink what you know about Queen Victoria and takes you into the life, palaces and rich colorful age of a woman who ruled a quarter of the globe. Free admission. Seating in the Robins Foundation Theater has reached capacity; overflow seating has been made available at the museum to watch the lecture via a live feed. A book sale will follow the lecture. Advance reservations required at rsvp@jyf.virginia.gov or (757) 253-4572. March 14: Tenacious Women Lecture: “Prisoners of History: Pocahontas and American Indian Women in Cultural Context,” Jamestown Settlement, 7 p.m. – Dr. Karenne Wood, Director of Virginia Indian Programs at the Virginia Foundation for the Humanities, explores two very different stories of American Indian women, Pocahontas and Mary Jemison. Due to illness, Dr. Karenne Wood is unable to attend Thursday night’s presentation. Her Tenacious Women Lecture “Prisoners of History” will be be presented by her designated proxy, Evangeline Calland. Ms Calland is an interfaith chaplain who practices in Charlottesville, Virginia. Free admission. Advance reservations required at rsvp@jyf.virginia.gov or (757) 253-4572. March 16-17: Military Through the Ages, Jamestown Settlement – Military re-enactors and modern-day units show how uniforms, weapons and military tactics evolved through the centuries. This year features a special salute to women in the military. April 4: Tenacious Women Lecture: “Matter Out of Place: The Writing of Ar’n’t I a Woman,” Jamestown Settlement, 7 p.m. – Dr. Deborah Gray White, Board of Governors Distinguished Professor of History at Rutgers University examines researching and writing “Ar’n’t I a Woman: Female Slaves in the Plantation South.” Free admission. Advance reservations required at rsvp@jyf.virginia.gov or (757) 253-4572. 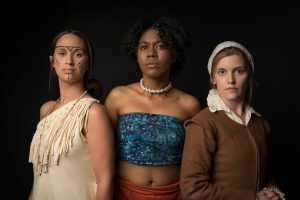 Tenacious women – Virginia Indian, African and English women reflected in “TENACITY: Women in Jamestown and Early Virginia” special exhibition at Jamestown Settlement. Jamestown-Yorktown Foundation photo. May 2: Tenacious Women Lecture: “Colonizing Women,” Jamestown Settlement, 7 p.m. – Dr. Kathleen Brown, David Boies Professor of History at the University of Pennsylvania, explores the relationships between the English women brought to early Jamestown, the men who desired them as wives and the Powhatan and Afro-Caribbean/African women affected by their presence. Free admission. Advance reservations required at rsvp@jyf.virginia.gov or (757) 253-4572. May 10-11 & 16-18: “Mother Tongue,” Jamestown Settlement, 7:30 p.m. – This original play explores the stories of three women of Jamestown – Matoaka, Anne Burras Laydon and Angelo – as they come together to consider if, and how, the future will remember them and why it matters. An evening ticketed event made possible by Dominion Energy. 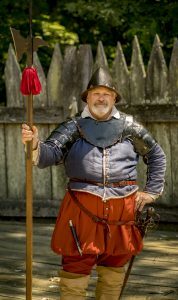 May 11: Jamestown Day, a jointly sponsored event at Jamestown Settlement & Historic Jamestowne – Salute the 412th anniversary of the 1607 founding of Jamestown, America’s first permanent English colony, with interpretive programs and artillery firings. Climb aboard a ship and see one sail at Jamestown Settlement, and take part in archaeological programs at Historic Jamestowne. Separate site admission. June 8-9: MY TENACITY! A Celebration of Women, Jamestown Settlement – If you’re not one, you know one! Tenacious women are celebrated with a weekend of female musicians, dancers, spoken-word artists, character portrayals, children’s activities, mural painting and more. An evening ticketed concert performance will accompany this event. June 13: Tenacious Women Lecture: “Piracy, Political Intrigue and Human Tragedy: Virginia’s First Africans,” Jamestown Settlement, 7 p.m. – Sharing her discoveries from previously unexamined documents, historian and author Martha W. McCartney presents her ground-breaking new research from the United Kingdom’s National Archives on the circumstances surrounding the 1619 arrival of Angelo and the colony’s first African people. Free admission. Advance reservations required at rsvp@jyf.virginia.gov or (757) 253-4572. June 20: Tenacious Women Lecture: “England’s Bartered Brides: Building New Lives in Early Jamestown,” Jamestown Settlement, 7 p.m. – British author Jennifer Potter shares untold stories of 17th-century English women who crossed the ocean to find husbands in Virginia. Free admission. Advance reservations required at rsvp@jyf.virginia.gov or (757) 253-4572. Billy Flora was a hero of the Battle of Great Bridge during the American Revolution. 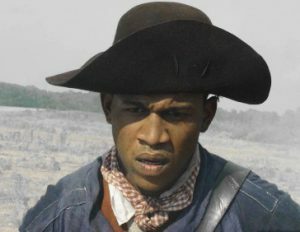 June 29, 2019 – March 22, 2020: “Forgotten Soldier” Special Exhibition, American Revolution Museum at Yorktown – Discover personal stories of enslaved and free African Americans who fought on both sides of the Revolutionary War through interactive elements and compelling art displays, including a new contemporary work by nationally acclaimed artist Titus Kaphar. Follow the forgotten stories of African Americans who enlisted as soldiers for the American cause for a free and independent nation and those who joined British forces with the promise of obtaining their own freedom. Related public programs feature a series of lectures, genealogy workshops and interpretive demonstrations with re-enactors from African-American military regiments. Held in conjunction with the 2019 Commemoration, American Evolution. Made possible in part by Altria Group. Cover page of the July 30, 1619, Minutes of the General Assembly. Courtesy of the National Archives of the United Kingdom. July 1 – August 1: Origins of American Democracy, Jamestown Settlement – Throughout this monthlong program, interactive experiences and interpretive programs honor the 400th anniversary of the first representative legislative assembly in 1619. 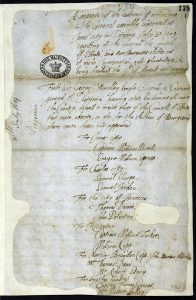 An exhibit showcasing the original minutes of the first assembly that convened on July 30, 1619, on loan for the first time in America from The National Archives of the United Kingdom, will be available for public viewing through September. Made possible in part by the Robins Foundation. July 4: Liberty Celebration, American Revolution Museum at Yorktown – Salute the 243rd anniversary of the Declaration of Independence with music, military drills and artillery demonstrations. View a rare July 1776 broadside surrounded by the signatures of those who proclaimed America’s independence and learn about the challenges that faced our nation’s founders. July 11: “Leadership in Turbulent Times” Special Lecture, Jamestown Settlement, 7 p.m. – Dr. Doris Kearns Goodwin, Presidential Historian and Pulitzer Prize-winning author, offers an illuminating exploration of the early development, growth and exercise of leadership. Advance reservations required at rsvp@jyf.virginia.gov or (757) 253-4572. July 27-28: Democracy Weekend, Jamestown Settlement – The 400th anniversary of the first assembly of 20 “burgesses,” which convened at Jamestown on July 30 – August 4, 1619, is marked with a weekend of themed tours, interpretive programs and military exercises. Re-enactments bring to life the beginning of representative government in America and the antecedent of today’s Virginia General Assembly, the oldest legislative body in the Western Hemisphere. September 12: Tenacious Women Lecture: “My Family of Women’s Rights Advocates: From Elizabeth Cady Stanton to Me,” Jamestown Settlement, 7 p.m. – Coline Jenkins, legislator, author, and the great-great granddaughter of Elizabeth Cady Stanton, a leading figure of the early women’s rights movement, sheds light on the evolution of American democracy through the inclusion of women as full citizens. Free admission. Advance reservations required at rsvp@jyf.virginia.gov or (757) 253-4572. September 13-14 & 19-21: “Season of the Witch,” Jamestown Settlement, 7:30 p.m. – An immersive nighttime theatrical experience about the 1626 witchcraft trial of Jane Wright takes place in Jamestown Settlement’s re-created fort. An evening ticketed event. October 10: Tenacious Women Lecture: “Gilt and Silk: Early 17th-Century Costume,” Jamestown Settlement, 7 p.m. – Dr. Rebecca Quinton, curator of European Costume and Textile at Glasgow Museums, explores Jacobean dress and the textiles used to make it, with particular reference to women’s wear and surviving items in the Burrell Collection in Glasgow, Scotland. Free admission. Advance reservations required at rsvp@jyf.virginia.gov or (757) 253-4572. American Indian Intertribal Powwow, October 12-13, 2019, at Jamestown Settlement. 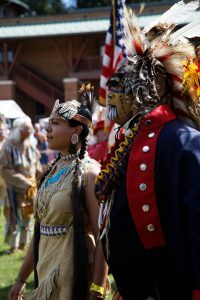 October 12-13: American Indian Intertribal Powwow, Jamestown Settlement – A two-day celebration of song, dance and storytelling by members of American Indian tribes. This year’s program highlights American Indian women with special performances, speakers and more. October 19-20: Yorktown Victory Celebration, American Revolution Museum at Yorktown – Revolutionary War re-enactors and artillery firings salute the 238th anniversary of America’s momentous Revolutionary War victory at Yorktown on October 19, 1781. October 19 commemorative events also take place in Historic Yorktown and at Yorktown Battlefield. October 25 & 26: Family Frights, Jamestown Settlement, 6:30-9 p.m. – A Halloween-themed museum night for young children and families features trick-or-treating, grisly games, ghostly tales, haunted houses and spooky ships. An evening ticketed event. November 9-10: The African-American Soldier, American Revolution Museum at Yorktown – Re-enactors representing African-American soldiers from the Revolutionary War through World War II and beyond demonstrate their role throughout history in the United States military. November 14: Tenacious Women Lecture: “We Cannot Be Tame Spectators: Tenacious Women in Early Virginia,” Jamestown Settlement, 7 p.m. – Dr. Cynthia Kierner, Professor of History at George Mason University, shares the stories of women who survived and thrived in an era when many women lacked property, education and civil rights. Free admission. Advance reservations required at rsvp@jyf.virginia.gov or (757) 253-4572. Gingerbread cookies and apples at the American Revolution Museum at Yorktown Revolution-era farm kitchen. November 28-30: Foods & Feasts of Colonial Virginia, Jamestown Settlement & American Revolution Museum at Yorktown – Explore centuries-old culinary practices and cooking techniques of 17th-and 18th-century Virginia during this three-day event starting on Thanksgiving Day. December 20-31: Christmastide in Virginia, Jamestown Settlement & American Revolution Museum at Yorktown – Experience 17th- and 18th-century Virginia holiday traditions with variety of interpretive programs, cooking demonstrations and musical entertainment. Museums closed December 25. 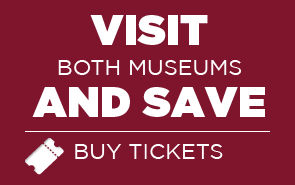 Admission: In 2019, a value-priced combination ticket to both museums is $26.00 for adults and $12.50 for ages 6-12. Admission to Jamestown Settlement is $17.50 for adults and $8.25 for ages 6-12. Admission to the American Revolution Museum at Yorktown is $15.00 for adults and $7.50 for ages 6-12. Children under 6 are free. Special programs and exhibitions included in admission during museum operating hours. Operating Hours: 9 a.m. to 5 p.m. daily year-round (until 6 p.m. June 15 to August 15); closed on Christmas and New Year’s days. General Information: Call (888) 593-4682 toll-free or (757) 253-4838, or visit historyisfun.org. Jamestown Settlement and the American Revolution Museum at Yorktown are administered by the Jamestown-Yorktown Foundation, an agency of the Commonwealth of Virginia accredited by the American Alliance of Museums.